The Larapinta Trail is located in the desert of central Australia, in the MacDonnell ranges. Although historically regarded as a perilous area for Europeans, the Aboriginees lived in the desert at a much higher density than do the new arrivals, who rely on supply from the big cities for their continued low density occupancy of the land. While Australians identify with their sunburnt country , few have visited it. 90% of them live in the big cities, in the wetter and milder 50 mile wide, thin coastal strip. The introduction, for most Australians to most of their their country, occurs in primary school, where they learn of the slow death, in circumstances of great privation, of party after party of unprepared explorers. The health of the few that survived was ruined. Successful exploration relied on befriending and accepting the advice of the Australian Aboriginees, something that was beneath most of the explorers. Some explorers died within sight of well fed and watered and presumably incredulous aboriginees whose offers of help had been declined, or in the absence of an interpreter, misunderstood. Until the late 20th century, visiting the red center required multiday trips over dirt roads, carrying extra spare tires, water and petrol. Most Australians were happy to leave well enough alone. With more interest and promotion, regular air travel to Alice Springs began and you can now arrive in a matter of hours, with little effort on your part, to stand in a place that until not too long ago was a death sentence to any European. Because of the low population density in central Australia, there is little air or light pollution and the starry skies are a haven for amateur astronomers. The Larapinta Trail traverses the MacDonnell Ranges, explored by Stuart in 1859 in his successful south to north crossing of Australia. Stuart's health was ruined by the rigors of exploration and he died after a period of ill-health following his return to England. For more info see John McDouall Stuart (http://www.pacificislandtravel.com/books_and_maps/stuart.html). Hiking in the red centre of Australia until recently required an epic of planning, preparation and supply. The Larapinta Trail was constructed to open up a part of the red centre for walking. At least now you don't have to plan where to go. Although it's promoted to the trekker, rather than wilderness walker, you still needs your wits about you: you're carrying a heavy load, you need to be able to dry camp, carry water and food for 5 days, and if you get yourself into trouble, you have to get out of it. For general information about the walk see John Chapman's Larapinta webpage (http://www.john.chapman.name/nt-lara.html). John has historical weather information at Larapinta weather webpage (http://www.john.chapman.name/nt-la-wg.html). Another trip writeup is available from a group of students from the University of NSW (the Laraparinta Mob) (http://www.cse.unsw.edu.au/~gernot/Larapinta/) who walked the trail in 2004. 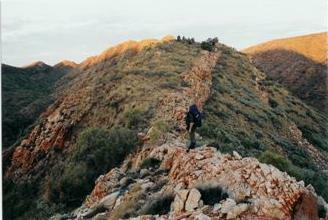 The Larapinta Trail traverses the rugged West Macdonnell Ranges in Central Australia. The route is divided into 12 sections. The total distance from Alice Springs to Mt Sonder being 223km. The best time to walk the trail is in the cooler months June to September. A splendid information package with photocopied maps can be obtained from the Parks and Wildlife Commission of the NT. at 08 8951 8211. We walked the Larapinta trail backwards from West to East. I made a booking with Trek Larapinta. Doug met us at the airport, took us shopping and transported us out to Redbank Gorge dropping off our caches along the way. The hike finished at Alice Springs and we did not need to follow a schedule in order to rendezvous with return transport. The drive through the ranges out to Redbank Gorge tends to spoil the presentation of the mountains somewhat. I could imagine that the panorama walking towards Mt Sonder and Zeil on the East / West route would be more impressive. Alternative '2' Would be to hire a car, drive out to Glen Helen, place the caches along the way, return to Alice and walk the trail from East to West. Transport from either Redbank Gorge or Glen Helen back to Alice after the hike can be pre arranged with a tour company. If you want to take your chances tourist buses often return to Alice from Redbank Gorge or Glen Helen with vacant seats. There is a public phone at Glen Helen. Alternative '3' would be to engage a tour company to plant your caches and start the hike from Alice. A problem with this option is that there is no kiosk at Ellery ck. and the cache must be buried there. Alternative '4' There are a number of guided walks displayed on the internet. Hikers need only carry a light pack and are joined each night by the support vehicle with meals and tents prepared for them. Alternative '5' for the not so adventurous is to take it easy and only walk a few sections of the trail. The day finally arrived. We had been planning this hike on the Larapinta Trail for a couple of years. The remaining sections from Serpentine Gorge to Standley Chasm had only been opened last April. I met Chris struggling up the hill towards Leura station with his backpack and weighty suitcase jam-packed with rations for our caches. We boarded the 0510 train to Sydney. Within a couple of hours we were waiting to check in at Kingsford Smith airport. I declared that I had some matches inside my pack and was asked to remove them before the clerk could dispatch my luggage. As I passed through the metal detector the alarm sounded. I entered the arch several times before it was discovered that the coach bolts I had screwed into the heels of my boots to reduce wear were setting off the alarm. Flight QF790 to Alice Springs was a brand new Boeing 737-800. Chris and I changed window seats to take turns of gazing at the fascinating scenery below. The green of the East coast gradually gave way to a desiccated landscape. Highways turned into minor roads than 4wd tracks, animal pathways and finally wilderness. The red sand waves of the Simpson Desert rolled endlessly over the horizon. We touched down at about 1130. Alice Springs is a modern city almost in the geographical center of Australia. Doug greeted us at the baggage carousel and loaded our packs into his van. Chris and I had packed dehydrated food at home but needed to stock up on cans, UHT milk, Ryvita biscuits, gas canisters and matches. We bought broomsticks for use as staves which steadied us on the rocky trail and prevented injuries by assisting us to stand with our heavy packs. Prior to leaving Alice we pigged out on the flavorsome food at Mc Donalds before being doomed to subsist on our bland hiking rations for the next two weeks. At a service station on the outskirts of town we pumped our water bottles hard with Todd River water. I phoned 1300 650 730 and recorded the details of our hike with the Walkers Registration Scheme. Hikers pay $50 via credit card which is refunded upon de-registering. A search and rescue mission is mounted if hikers do not notify the scheme within one day after the designated return date. You could be liable for the cost of the search if there is a false alarm. I also carried a IPIRB which would summon help sooner if a serious problems developed. It was 1430 by the time we departed Alice. Doug gave us a running commentary on the local history, fauna and flora as we motored along Larapinta drive towards the West Macdonnells. Chris and I had bought along six Tupperware boxes. We packed four days of dehydrated rations, spare gas canisters and batteries into each of them. As a treat we also included breakfast cereal, UHT milk and cans of food. The first cache was deposited at the Standley Chasm kiosk. The proprietors were pleased with the box of chocolates that we presented to them for minding our supplies. Our next cache stop was at Ellery Creek Bighole. I had arranged with Doug to bring a shovel along. We decided to bury our supplies in the dry Creek bed nearby. Chris took note of the location by using a compass bearing and drawing a simple map. The red flame from the setting sun enhanced the rust colours of the majestic Macdonnells as we approached our last cache stop at Glen Helen resort. This is a well appointed wilderness lodge with a sheer quartzite rock face as a backdrop. The ancient Finke River bed is located nearby. There is a choice of accommodation for hikers or travelers in the luxurious lodge, bunkhouse or camping area. The ebony night was closing in around us by the time we reached Ridgetop Camping area. We dragged our gear out of Doug's van and piled it onto a picnic table. I wondered how we would stuff all this equipment into our packs the next morning. There are gas bar bq's and pit toilets but no water or firewood in the camping ground. Don't expect any soft grassy camping spots on the trail. I was glad that Chris included a tarp to cover the dusty, hard ground. We heated some canned food on our stove for dinner. It was difficult to comprehend that this morning we awoke at home on the temperate East Coast and now were sitting in the isolated red center of our continent. The dry clear atmosphere in central Australia can not retain infra red heat after sundown. Occasionally we found our water bottles frozen solid in the morning. I slept in a feather down sleeping bag rated to -5deg. with a silk inner. Usually I woke up sticky and uncomfortable. I would strongly recommend carrying two sleeping bags. A feather down bag to climb into during the early night and morning when the tent is cold plus a light summer bag to use when body heat warms the tent. The sleeping bag not being utilized can act as a mattress. The alarm woke us at 5am. It was still dark. Chris took the fly off the tent and we gazed up at the brilliant stars cape sparkling unobstructed from horizon to horizon until first light crept across the landscape and expand our perception of the environment. We had breakfast and fed our gear into the backpacks until they were tight as a drum. I carried not less than 5L of water at all times. There are no tanks at Woodland and Ridge top camping areas although good quality water can be scooped out of Redbank Gorge. It was 0830 by the time we left our night camp. We decided to walk cross country to the Redbank Gorge car park. A friend advised us to wear gaiters for protection against the prickly Spinifex spines. I was very glad that I headed this advice. The sharp needles can easily penetrate clothing and pierce the skin. My hands had numerous festering sores where I had brushed against the spikes. Soon we reached the car park but could not locate the track that crosses the dry creek bed. We realized later that the tack followed the road down to the creek and continued again directly on the other side. The Larapinta route is marked in varying frequencies with small blue triangles. Distance indicators are also placed along the way commencing at 0 near the old telegraph station in Alice and finishing at 223km on top of Mt Sonder. Intermediate markers also indicate distances within each section. The distance markers must be read in reverse when walking from West to East. I took along topographic maps of Alice Springs and Hermannsburg 1:250000 to assist with navigation. A reliable compass should also be carried. Chris and I followed the track for a short distance towards Glen Helen. We made a detour into the scrub to find a tree where we could hang our packs so that they would be out of view and safe from wild animals. The track up to Mt Sonder (1330m.) is approx 16km return from the Redbank Gorge parking area. It took 3hrs to climb the steep rocky spine to the peak. This was our first elevated view of the W.Macdonnell Ranges. The 360deg panorama of the jagged tilted strata decorated with subtle shades of pastel green and light blue vegetation is magnificent. We had lunch at the peak and recorded the details of our hike in the log book. We met two ladies and their leathery guide on the final stages of their hike from Alice Springs. They had taken a short cut from Glen Helen up the side of Mt Sonder. The afternoon was quite warm as we descended the mountain. I became very sun burnt on the face. A wide brimmed hat should be worn and sun block applied regularly to shield exposed skin from the relentless sun, especially at higher altitudes. We reached the base of the mountain at 1600. It is a 3km return hike through a dry creek bed to Redbank Gorge. There is a large body of water at the end of the ravine. A few rock wallabies grazed the sparse vegetation on the elevated banks. We planned to have a swim in the gorge but my temperature sensitive toe determined that the water was freezing cold. Chris and I retreated to a more open part of the gorge where the sun had warmed a couple of smaller pools. We filled our water bags and bathed in the tepid water. People are advised to sterilize all drinking water on the trail. We purchased 70 Puritabs each but only used a couple. The pools in the gorges sometimes had harmless algae growing in them but the water was quite clear and pure. I always made sure that there were no dead animals laying in the pond before taking water. There are tanks at a few locations on the trail. These are serviced regularly by the rangers. Hikers should not waste this meager water supply. There are several access roads to Namatijra drive from the Larapinta trail except on the new sections 4,5 and 6. It was getting dark as we cut our packs down from the hanging tree and found a comfortable camping spot in a dry creek bed nearby. We should have set up camp here on the first night. Whilst in Alice I wondered why the Kooris preferred to congregate in the Todd river bed. Weary hikers can expect to find shade, soft clean sand, plenty of driftwood and maybe even a thirst-quenching pool of water in these welcome retreats. Avoid camping in water courses during heavy rain or thunderstorms. Be aware that flood waters can flow down these channels from a great distance. Chris erected the tent whilst I built a fire to simmer punctured cans of baked beans and Irish stew in the coals. We washed dinner down with the quintessential Ausie taste of Billy tea boiled in a smoking eucalypt fire. It is difficult to leave the warmth of a campfire on freezing desert mornings. We made an effort to get up early and were on our way by 0900. The track skirts around the Southern side of the range on the edge of Mereenie Valley. The going is quite easy. We met a couple of grubby hikers who had treked from Alice. This was their last day and they were running short of food. Chris was pleased to offload some of his surplus dehydrated rations to them. We reached Rocky Bar Gap by midday and found some shade between the narrow walls of the ravine. There is a small water tank and a rough access road to Namatjira drive nearby. Our lunch consisted of Ryvita biscuits spread with peanut butter, Promite, jam or cheese and washed down with packet soup. Leaving Rocky Bar the track cuts through a breach in the range before making a steep ascent to Hilltop Lookout (1). The view from the top is excellent. Glen Helen can be seen in the distance. A short cut across country through Mereenie Valley to join the trail at about 4km distant could be taken instead of making the steep climb up to Hilltop Lookout (1). I find that during a strenuous hike late afternoon is the time of day when moral tends to decline. Feet and shoulders begin to ache with the burden of a heavy pack. A descending pathway is tough on tender feet. Toes tend to be jammed and rubbed in the face of hiking boots. We could feel blisters starting to form as we scrambled down the precipitous slope from Hilltop Lookout (1). The track reaches Mereenie valley and traverses the vast river sedimentary deposits laid down over millennia. There is a large waterhole where the trail crosses Davenport Creek. Aquatic birds and cattle linger there. We trudged wearily towards Glen Helen counting down the distance via the track markers. The sun had kissed the landscape goodnight by the time we reached the junction of the Glen Helen and Ormiston Gorge trail. We continued on in starlight tapping our broomsticks on the stony track like blind men. It was 2015 by the time we dropped our packs at reception and booked into the bunkhouse at Glen Helen Resort. I sat on the bed and took off my boots. The condition of my mangled feet shocked me. Large blisters covered the toes and balls of my feet. Chris's feet were in a similar condition. I had doubts as to whether we could continue the hike. We had a shower and enjoyed a meal in the restaurant. The caretaker fetched our cache from under the bar. We returned to the bunk house and were soon snoring the night away. After a massive breakfast we took a helicopter flight over Ormiston Gorge. The scenery is stunning. This is the best way to gain a concept of the long jagged spines that form the W.Macdonnell Ranges. It was time to check out. We crammed 4 days of rations into our already bulging packs and topped up our water bladders. I carried a water bag in my backpack with a drinking tube attached to my shoulder strap for easy hydration. At 1100 we slung our packs onto our backs and waddled away from Glen Helen trying to avoid stepping on our painful, throbbing blisters. The trail follows the sealed road West for about 600m before branching off to the North. If you wish to avoid walking this section a comfortable shuttle bus runs daily between Glen Helen resort and Ormiston Gorge. Soon the track crosses a wide, dry riverbed junction where Davenport Creek and Ormiston Creek merge to form the ancient Finke River. The trail traverses flat open country until it reaches Hilltop Lookout (2) where some undulating territory must be negotiated before arriving at Ormiston Gorge. 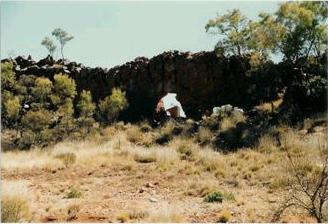 There is a dusty camping area for hikers before reaching the visitors center at Ormiston Gorge. Here one can maintain the isolation of the ranges. It gets quite busy with day trippers down at the picnic area. Alternately to the right of the visitors center you will discover another camping area mainly occupied by 4wd enthusiasts. There are hot showers and toilets in the amenities block!! At the kiosk one can buy a few items such as snacks, ice cream, drinks, film etc. There is no public telephone at Ormiston Gorge. We set up camp in a picnic bay near the information center and were pleased to find a picnic table, water tap and gas bar bq available. Chris and I walked down to the gorge in the twilight. A deep pool is cradled within towering red stone walls. Nimble rock wallabies bounded out of crevices and scurried across narrow ledges chasing interlopers from their rocky balconies. Ormiston is perhaps the most magnificent gorge along the trail. Next morning we were told to "move along" by the ranger . The park authorities do not want smelly hiker riff raff with their washing hanging on trees and gear spread everywhere spoiling the ambiance of the picnic bays. There is a steep climb onto the long slender Heavitree Range. We had lunch at the top sitting on the sharp rocky rubble in the afternoon sun. The track snakes around stony outcrops along the crest for about 4km until 'Lookout' is reached. Chris found a clearing where rocks and Spinifex had been kicked aside to form a rough cut camping spot. We ate dinner watching the evening light cool and soften the serrated topography of the ranges. Chris invented the water ration sponge. He would warm half a billy of water and add a little soap to wipe away the sweat and dirt with a 'Chux' cloth from his shivering body. I was too tired to have a wash that evening. My sticky, smelly skin kept me awake until 3am when I was compelled to crawl out of the tent and have a sponge in the freezing darkness. The trek down to Waterfall Gorge is quite steep. We imagined that there would be a gushing waterfall in the ravine but were disappointed to find only a dry cavern gouged out by sporadic flood waters. We entered a long bleak valley charred black and devoid of life following the recent bushfires. The track twisted through tombstone like outcrops studded with shimmering mica. Pioneer Creek was dry. In the late afternoon we reached Inarianga pass. The pass cuts a narrow passage through the range to the South. Large river red gums and prehistoric Cicard ferns grow within the corridor. The gorge is quite rugged with many large boulders to scramble over. In the lower reaches of the pass there are welcome pools of refreshing water shining like diamonds in the dry creek bed. Beyond the gap there is a well defined track junction. A fork to the SW. leads to the Ochre Pits which is an 8km return journey. We did not have the energy to make this detour and continued on towards our night destination. The romantic title 'Serpentine Chalet Dam' conjured up expectations of a pleasant weir surrounded by greenery. We were disappointed to find a dusty cleared area with a couple of small water tanks close by. We had a billy sponge and washed our underclothes. I cooked some Vesta curry and rice wile Chris erected the tent. The best way to cook in the bush is to boil water, add the ingredients and then leave the meal to stand and soften. This method saves on fuel and prevents food from sticking to the cooking pot. Each night we took off our boots and gazed with pity at our swollen blistered feet. We experimented with bathing them, lancing the blisters or placing dressings over the lesions but nothing seemed to heal them or relieve the burning. I discovered that sand can get into broken blisters and cause irritation to the raw skin underneath. I flushed the grains away with a syringe. In the morning we walked a short distance up the dry creek bed to find Serpentine Chalet Dam. This small body of stagnant water once provided precious moisture to the former Serpentine Chalet. There is a track from the camping area leading to the ruins about 2.5km distant. The trail to Serpentine Gorge follows a gentle course on the Southern side of the Heavitree range before climbing steeply onto its backbone. At Courts Point there is a fabulous view to the West of Gosses Bluff, Glen Helen, Mount Sonder and Zeal. Figure 2. Mt Zeal in the distance (the highest mountain in W. Macdonnells). Photo was taken from a helicopter flying towards Ormiston Gorge. The walk along the range is superb with 4.5km of 360deg views over the rugged Macdonnells and intervening planes. Chris was appalled at the number of feral cat scats that we came across on the Larapinta. He was raving all day about planting dummy, exploding mice to get rid of the pests. In the late afternoon we climbed down from the Heavitree range and soon reached Serpentine Gorge car park. We discovered a water tank and helpful information board. On the other side of the dry creek bed there is a deserted penal work camp. Prisoners cut many kilometers of track through the ranges. I locked Chris in one of the cells and took his photo. Our legs were tired and wobbly from the days march but we felt compelled to dump our packs and walk the 2.25km return trip to Serpentine Gorge. It was worth the effort, yet another grand gorge. We rinsed our clothes and sponged ourselves in a small pond near the main body of water. At last light we struggled back to the car park with our bulging water bags. I cooked another bland 'cream of soggy cardboard' pasta dish for dinner. It was 2200 by the time we wriggled into our comforting sleeping bags. In the crisp morning air we stomped around the camp fire until orange flames licked and warmed our frozen legs. After breakfast we packed our gear and walked up to the parking area. A group of 4wd enthusiasts were checking their vehicles before driving onto their next camp. They watched us with admiration as we set out carrying our laden packs. The track traverses flat ground on the Southern side of the range at times passing quite close to Namatijira Drive. Wild fires had scorched the life out of every stick of vegetation in the area. Wilted branches sagged across the track making passage very difficult. We found it easier to walk through the clear ground adjacent to the trail. There are some interesting rock formations near Ellery Ck which have the appearance of gigantic dinosaur dorsal plates. I was becoming anxious as we walked towards Ellery Ck wondering if our second cache of supplies buried in the parched creek bed would still be intact. As we approached I could see the large River Red Gum which marked the spot were our supplies where buried. The sand had not been disturbed. We realized how Bourke and Wills must have felt struggling towards their food depot at the dig tree. Chris and I burrowed through the sand with our bare hands. We soon unearthed the plastic boxes containing our precious supplies that would sustain us until Standley Chasm. I felt like a child opening Christmas presents. The brightly colored cans and packaging were in stark contrast to the subtle pastel shades of the Macdonnells. Chris sat down in the sand and encircled himself with cans of food. He shook them, read the labels and examined each of them with gastronomic intent. I passed him the tin opener. He opened a can of baked beans in ham sauce and poured the contents into his dixy. I heard him groaning with delight as he swallowed the scrumptious meal. I settled for a packet of Nutra Grain with peaches floating in UHT milk. The large sumptuous lunch made us feel queezy as we stowed the remainder of our provisions into the packs. A group of campers in the picnic area kindly volunteered to dispose of the plastic boxes, rubbish and excess items for us. We each poured 9 liters of water into our bladders from 'big hole' for the two day hike to the next reliable water source at Hugh Gorge. Our bursting packs weighed approximately 15kg heavier with 4 days rations and the extra water. The Larapinta Trail now heads NE into remote country away from Namatijra Drive towards the Chewings Range. Shortly the track enters a gap in the range and passes through the rugged glacier worn tillite formation at 'saddle'. As darkness washed the color from the landscape we descended to lower ground between the ranges. Chris spotted a dry creek bed and set up our tent on the chilly sand. I pierced the remaining cans of food and threw them into the camp fire. After doing our chores we crawled into bed at 2200. Some hikers we had met earlier told us about a short cut via a stock route which bypasses the rolling route that the Larapinta trail follows in this vicinity. We soon located the stock route and followed it East towards Rocky Gully. My pedometer was helpful in estimating distance. It is easy to anticipate the destination without some means of measuring how far you have traveled. As we marched along the stock route we noticed numerous small craters in the sand. Ants fall into these tiny depressions and are unable to climb up the loose sandy walls. At the base of the crater they are devoured by a beetle like creature known as an Ant Lion. Geccos also relish tender ants. We often saw a lizard waiting at the side of the track for a hikers boot to squash an ant and create an easy meal. After walking about 5.6km. along the stock route we decided to head across country to rejoin the Larapinta trail. We felt like 'babes in the woods' as we followed a compass bearing North through the isolated, arid countryside. Chris enquired anxiously about the range of my IPPR. We became worried as the 1.5km distance to the Larapinta Trail was exceeded. By chance during a rest stop I happened to glance at a Witchetty bush and wondered why there was a piece of tape hanging from it. At the same time Chris looked to the right and noticed a trail marker. We realized how easy it would be to intersect with a faint track and pass over it without noticing. In hindsight it would have been more prudent to follow the stock route all the way to Rocky Gully and pick up the Larapinta trail there. In the distance a scorching sun excited the air to shimmer like a cool lake. It was pleasant to walk through green unburnt, countryside for a change. Chris was like a mountain goat in steep terrain scrambling over rocks and steps leaving me dragging the chain far below. The flats were my event I would sprint well ahead singing to myself in order to maintain rhythm. We both enjoyed these periods of solitude. Just past Rocky Gully we reached the 100km to go distance marker. We took photographs, rested and wondered if we had the energy to complete the journey ahead. Ghost Gum Flat is a pleasing alluvial plane with many large Ironbark and Corkwood trees beckoning hikers to rest in their shade. The sun dipped below the horizon as we lurched down the track towards Hugh Gorge. We were both suffering from blisters, sore shoulders and chafed thighs. It was 2000 by the time we entered the looming ramparts of the gorge and set up camp on a sandbank next to glistening pools of moonlit water. This 26km stage had tested our endurance. Our bodies were pounded, stretched and strained to their limit. After cooking dinner and rinsing some clothing we finally hit the Thermarest at 2300. In the morning we abandoned our packs and explored a remarkable red oxide gully branching off from Hugh Gorge to the North. We returned to our camp at 1200. After lunch we set out clambering along the boulder strewn floor of Hugh Gorge. There is a large, deep pond within the gorge that is difficult to bypass. Chris and I hoisted our packs onto the large flat rock in front of the pool. We then scaled the slippery stone in our bare feet and detoured around the left bank. One can take an alternate route that avoids the rugged Razorback Ridge and traverses the lowlands to intersect with Birthday Waterhole access road. The rugged curve of Hugh Gorge eventually unravels into Linear Valley which extends SE for 3.5km towards 'Creek'. The sparse blackened countryside offered good hunting for graceful Wedge Tailed eagles and Kestrels soaring above on the warm desert thermals. We reached 'Creek' at 1700. The cool pools of water and a shaded sandy creek bed inviting us to stay for the night. Chris reminded me that we should cover more distance due to our late start this afternoon. We walked along the creek into a narrow, steep gorge where we found running water and toped up our supply. The track is dangerous and indistinct as it ascends the steep face of Razorback Ridge. In fading light we scrambled along the sharp, jutting spine towards Rocky Talus. Darkness soon ran its murky fingers over the landscape. We were compelled to set up camp where we stood. Chris and I frantically cleared Spinafex and broke off protruding rocks for a place to erect the tent. As I gazed out over the nocturnal topography I was fascinated to see what I thought were pockets of mist scattered amongst the sleepy terrain. Chris convinced me that this was moonlight highlighting prominent features as it flooded the dry, craggy landscape. Chris was still thawing out in the tepid yellow rays of morning light as I stumbled down the stony slope towards Spencer Gorge. The trail becomes quite indistinct in rocky areas. We found it safest to leap frog from one blue marker to the next, back tracking if the following pointer can not be found. Chris soon caught up with me. Breakfast was taken in the sheltered gorge. We washed our plates in a small soak of stagnant water within the dry creek bed. Unexpected revitalizing pools of water would often surprise us along the Larapinta trail. A good camping spot is located at the track junction for Birthday Waterhole and Mitbush Spring. It was too early to stop for the night so we continued on down the trail. If you wish to see Birthday Waterhole there is a 2km return diversion. Fresh water and vehicular access to Namatjira Drive can be found there. It did not take long to reach the small trickle of water amongst parched boulders known as Mintbush Spring. The section of track ahead leading to Standley Chasm is probably the most rugged on the trail. We labored up Stuart's Pass with the hot afternoon sun scorching our backs. Approaching the summit we met two ladies gingerly descending the slope carrying 12 days supply of rations. We offered each other useful information about the conditions ahead and continued on in opposite directions. At the top of the pass we discovered a couple of 44 gallon drums full of cool water. It was liquid treasure. We sat in the shade, bathed the sweat from our faces and drank refreshing cups of Staminade. Chris orientated his map and pointed at the imposing mountain to the NE. Surely this was not Brinkley Bluff inviting us to climb its steep face in our fatigued condition! Our trepidation was realized as the track headed directly towards its vertical walls of searing stone. The trail becomes very indistinct as it ascends the bluff and can only be followed by searching for blue markers or tape hanging from bushes. The light was fading as we scrambled towards the crest. The steep ground leveled off and in total darkness we felt about on the summit (1209m) for a clear spot to lay our tent. Chris set up camp whilst I struggled to cook a meal as the cold evening breeze stole the heat from our gas stove. Strong winds battered the nylon walls of our tent all night. Chris braved the elements several times to lay stones around its perimeter. Our alarm broke the silence of another sleepy desert sunrise. A marsupial mouse scurried away from our dirty dixies as I brushed the tent flap aside and ventured outside. The cold desert air pierced my skin like sharp icicles. We had breakfast and set off early towards Standley Chasm. The track follows the sharp Quartzite lip of Brinkley Bluff for about 4km towards Reveal Saddle. The full circumference panorama of the mountains is spectacular. To the North one can see the barren Tanami Desert dissected by the Tropic of Capricorn. Missionary Plane and Larapinta Drive may be observed in the South. Chris was determined to reach Standley Chasm before midday to observe the momentary splash of sunlight that shines through the narrow rift and illuminates the chasm floor. Beyond Reveal Saddle the track follows the old bridle path through a narrow descending valley then along a rocky creek line towards Standley Chasm. Chris became frustrated with the meandering, undulating track which seemed to pursue the steepest part of the terrain. He whacked a marker post with his walking stick and broke it in half!! Eventually we were plodding along the sealed Standley Chasm access road. We dropped our packs at the kiosk and scurried off towards our goal. Unfortunately we were late. It was disappointing to stand in shadow and see the impatient shafts of sunlight climbing up the sheer walls of the gulch. Our frustration was soon forgotten as we returned to the kiosk to sit on the verandah and devour juicy hamburgers, chips, soft drinks, Mars bars and double choc Cornettos. The kiosk attendant recovered our cache from the storeroom. We squashed four days of provisions into our packs and filled our water bags. I discovered an amenities block and enjoyed the luxury of having a shave and sitting on a flush toilet. It was late afternoon by the time we departed Standley Chasm. The trail passes through sunny Lemon Wattle and majestic green Cycads as it climbs onto the red, scalloped quartzite range again. It was almost dark by the time we set our sweaty packs down at Millers Flat. I spent another sticky, uncomfortable night in my sleeping bag alternating between sweat and shiver. There are two routes from Millers Flat to Tangentyere Junction. The scenic pathway for the more energetic climbes 300m up into the mountains. Due to our declining energy levels we decided on the gentle lowland route. After passing Tangentyere Junction the track takes a fairly placid course through Arcacia scrub to enter a breach in the range at Fish Hole. Here we discovered a large, sun drenched pool. Chris and I took off our clothes and plunged into the icy water. We briskly massaged the dirt and sweat from our skin before the cold numbed our muscles. We rinsed our clothes and hung them in the trees to dry. I cooked some tomato soup wile we lounged about naked on the warm rocks surrounding the pond. Life does not get much better than this. The afternoon sun scorched our backs as we trudged along a sandy water course leading to Jay Creek. The picnic area at Jay Creek consists of a lonely water tank and bar bq. perched on the left bank. Shade is lacking. There is a 4wd track offering access to Hamilton Downs Youth Camp and Alice Springs via the Tanami Rd. 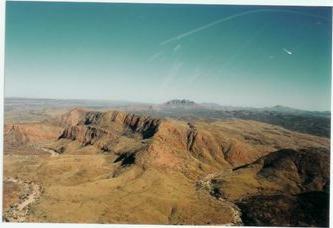 The Macdonnell Ranges are less rugged now and give way to isolated outcrops, low ridges and planes. Our pace accelerated to 4-5 km/hr as we marched through the Mulga clad landscape. We disturbed a couple of nervous Euros grazing on the course vegetation near a splendid water hole at Spring Gap. Camping is not permitted here. As darkness descended we wearily felt our way through the blackened scrub towards our rest stop at Mulga Camp. This picnic and camping area is well appointed with water tanks, a pit toilet, bar bqs and picnic tables but popular use makes firewood scarce. We erected our tent on the soft river bed sand. Sunrise bathed the frosty landscape in pink and orange shades as we went about our morning ritual of packing and preparing for the days march. This flat, sparse country offered little variation to our center of gravity continually being squarely over our hot, sweaty, tender feet. We soon developed large red, fluid filled welts on our toes and heels. Each step became painful. We even discussed abandoning the hike and getting a lift back to Alice Springs. Simpsons Gap is a major tourist destination with toilets, picnic facilities, running water and sealed vehicular access to Alice Springs. There is no canteen. The scrumptious aroma of bar bq. sausages haunted us as we prepared our lunch of thin chicken soup and crumbling Ryvita biscuits spread with warm jam and wafer thin slices of rancid cheese. Chris and I moseyed down to Simpsons Gap in the late afternoon. We admired the sculptured, cathedral like walls gouged out of Rangutjirba ridge by the occasional surge of floodwaters down Roe Creek. There is a vast, sandy beach with a large pool of holy water within the gap. We climbed out of Simpsons Gap at 1600. The track skirts the side of Hat Hill Saddle before descending to the flats again. At the 17.8 marker we made a short detour to investigate Scorpion Pool. Spring water rises here through limestones that were laid down within an inland sea 850 million years ago. Calcium Carbonate salts smear the ground in places like frost. Late evening is the most wonderful time to wander in the solitude of the ranges. The peaceful landscape is bathed in a cool, soft, crimson glow. Our variable walking pace separated us between rest stops. My seclusion in this empty, primeval wilderness gave the impression that I was the only person remaining on this empty planet. Once again we were caught out by darkness. We stumbled into Wallaby Gap at 1900. There are good facilities there. Running water! toilets, gas bar bqs. and shelter sheds. Chris stood on a picnic table to have a billy sponge wile I coaxed reluctant flames out of some meager firewood to warm us wile we ate dinner and debriefed on the day's hike. We awoke to the sound of warbling Currawongs for our last day on the trail. The track soon climbs up onto Euro Ridge where there are sweeping views of Alice Springs. This outcrop marks the Eastern extremity of the West Macdonnell Ranges. From Euro Ridge the track descends again to flat, tedious country. The trail crosses beneath the Stuart Highway at Geoff Moss Bridge. Along the way we passed some of the historic Overland Telegraph stanchions leaning over like ancient grave stones. A lonely wire was strung between them in 1871 to link Adelaide with Darwin. The remains of an early station master are buried in an elaborate, lonely grave just before the Old Telegraph Station. We sat in the shade on the cool stone border and ate the remaining odds and ends from our ration bags. Chris prized off his boots. His feet were covered in large blisters at various stages of development. His soles reminded me of a polar explorers feet effected by frostbite. At 1430 we reached the Old Telegraph Station to conclude our hike. There was no brass band or mayoral welcome to celebrate our achievement but the memories of the transparent desert air, seclusion, the jagged oxide ranges, magnificent gorges and clear nights sitting around the campfire looking up at the star filled heavens are accolades enough to hold in my heart forever. Paraphrased from "A Fair Go for All", (C) 1991 George W. Renwick, Intercultural Press Inc, a book for Americans moving to Australia..
My home thoughts will fly.